Before you begin to install your laminate floor it is important to ensure the subfloor is completely level and free of any debris. Remove the skirting boards and scrape off any glue or paint using a putty knife. Once you think your floor looks nice and level, check over the area with a spirit level. Slightly high or low points can cause your flooring to feel less solid in certain areas so it is paramount to iron out any issues now. If you are unsure, consult the manufacturer’s specifications. Measure the length and width of each plank and then measure your room to find out how many planks you will need to lay. It is unlikely that the room will fit an exact number of planks so be prepared to cut at least one board down to size. When cutting boards, it is important that none of them are cut to less than 2” in width. 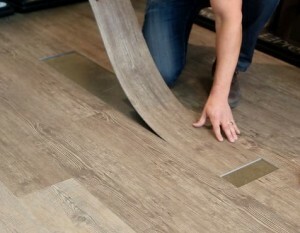 Finally, allow your laminate flooring to acclimatise for 24 hours by leaving it in the room it will be installed in. Time needed to acclimatise may vary between suppliers. Roll out your underlay from one side of the room to the other and cut to size. If using multiple pieces of underlay, ensure they do not overlap. Leave space for any pipes that will intercept the floor, and tape the underlay down. To begin, start to lay the first row and check to see how long the last piece on the row will be. This piece should be no shorter than 12” so trim the first piece as well if necessary. Leave room for expansion by using spacers all the way around the wall. Once you have all the pieces of your first row laid out, attach each piece together end-to-end by slotting the tongue into the groove. Begin the second row with the piece you cut off from the first row, making sure that the seams are staggered. Continue across the room, ensuring each row is pushed firmly together. If you reach a point with a pipe, draw around the shape on the underside of the board and cut around, allowing an extra 16mm for expansion. Once you have finished laying your floor, remove the spacers and attach beading to replace the skirting board. Once installed, laminate flooring is easy to maintain. Regular sweeping or hoovering will remove any dirt and avoid scratches from debris being stuck underfoot. 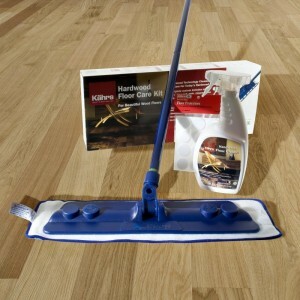 The floor should also be cleaned regularly using a well rung-out mop and an approved cleaning solution. Although laminate is more water resistant than solid wood, it is still important to wipe up any spills quickly as water left on the surface may cause damage. View all our laminate floor collection here! To prepare, begin by ensuring your subfloor is clean and dry – hoover the floor to remove loose dirt and clean with a damp mop before leaving the surface to dry. Transport your tiles inside their boxes in neat stacks. The tiles will then need to be acclimatised to the room’s temperature and humidity for at least two days before installation. It is recommended to have the room between 18 and 30 degrees C.
Start by mixing up the tiles to make sure you don’t have too many identical ones placed together. Measure the floor to establish how many tiles you will need and if any need to be cut to size. Bear in mind that the last row of panels should not be narrower than 5cm. 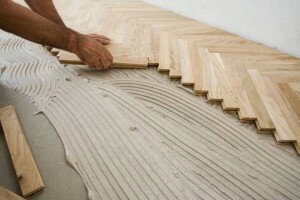 Begin laying the tiles in a corner of the room without any glue. It is recommended to dry fit the tiles at first in case you find they aren’t quite straight later on. Draw a line along the first two dry fitted rows – this line will mark where the glue will be applied. Once you are happy with the arrangement of first two rows of tiles, remove them from the floor and apply the vinyl glue to the subfloor. Lay the tiles into the adhesive, adjusting to the correct position. Remove any glue residue with a damp cloth. Repeat this procedure to cover the whole room. Once you have laid the whole floor, use a heavy roller to press the tiles into the adhesive and ensure they are well stuck down. This should be done within 30 minutes of laying the floor. Luxury vinyl tiles are popular as they are so low-maintenance! The floor will need to be hoovered or swept with a soft brush to remove any loose dirt and cleaned with a wet or damp mop. Avoid dragging heavy furniture across the floor and keep away from direct contact with high temperatures. View all our luxury vinyl tiles collection here! Carpet tiles are a functional and stylish flooring option, ideal for both commercial and residential purposes. If you have chosen carpet tiles for your home or office, read on to learn how to successfully install them – from preparation to aftercare. Begin by measuring your tiles and the room you would like them to be installed in. this will help you decide how many tiles you will need and if any need to be cut to size. Carpet tiles will need to be removed from their packaging and acclimatised to the room’s temperature and humidity for at least 24 hours prior to installation. Prepare your subfloor by vacuuming or sweeping to remove loose dirt. The tiles can be laid straight onto the subfloor without an underlay. However, if the subfloor is damp, it will need to be sealed before the tiles are laid. On the back of each tile there will be arrows to indicate the direction of the pile. Generally, you would choose to have all the tiles facing the same way. However, you can create a pattern by laying each tile at a quarter turn to the previous one. Measure the width and length of the room and mark the central point. Start by laying the first carpet tile on your central point and work your way out – you can practice laying the tiles out before you apply any adhesive. Once you are happy with the layout, remove any carpet tiles from the floor and apply the carpet adhesive using a roller. Once the adhesive has gone from white to clear, you can start laying your tiles from the centre out. Regularly check that carpet tiles are stuck down properly before moving onto the next. Note that some carpet tiles come with adhesive tabs so will not need any extra glue. When you get to the perimeter of the room you may need to cut some tiles down to size. When cutting, have the back of the tile facing up and make a few scores over where you would like to cut – you will then be able to snap the excess off. Finally, draw the knife along the edge for a clean finish. It is recommended to use some double-sided carpet tape around the perimeter of the room. Regular vacuuming and cleaning up spills quickly is recommended to keep your carpet tiles looking pristine. Stains can be removed using a carpet cleaner, however, one of the benefits of carpet tiles is that if one becomes irreparably damaged or stained, it can easily be removed and replaced. Click here to view all our carpet tile collection! Solid wood flooring is the perfect option when you are looking for timeless style and durability. If you have chosen a solid wood flooring for your home, read on to learn how to successfully install it – from preparation to aftercare. As solid wood flooring is a natural product, it will need to acclimatise to the temperature and humidity of your home before it is installed. Solid wood should be left in its packaging to acclimatise as this helps the boards to keep their natural shape. The time the flooring needs to acclimatise will vary depending on the species of wood, so check with your supplier if you are unsure. Finally, prepare your subfloor by ensuring it is clean and dry. Once you have allowed your flooring to acclimatise and prepared your subfloor, you can start to lay your solid wood flooring. To begin, position plastic spacers along the longest wall, then fix the first row of boards. Your boards may have a tongue and groove system – if this is the case, start from a corner and ensure the groove of the board is facing the wall. The second board will be laid end-to-end with the first. Measure the space left between the first board and the opposite wall, and cut the second board to size. Be sure to allow at least 10mm for expansion around the perimeter of the room. Continue across the room, ensuring that seams between boards are staggered and do not line up. Finally, re-attach your skirting boards. There are many ways to fit a solid wood floor, the floating method described above is considered the easier method. 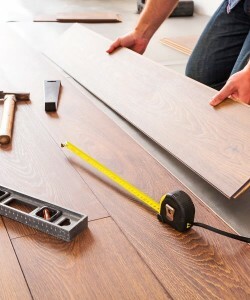 However, you can also fit your floor using a secret nailing or glue-down method. Secret nailing is a method used when laying your flooring straight onto a wooden sub floor or joists. It is named ‘secret nailing’ as the boards are secured by nailing at a 45-degree angel through the tongue of the board – meaning that the nails cannot be seen once the flooring is finished. Glue-down is also a popular method of installation and is usually used when laying wooden flooring over a concrete subfloor. Adhesives have a flexible quality which works well with the natural swell and movement of wooden flooring. For glue or nail installation where the boards exceed 8m, an extra expansion should be left between the rows. A well looked after wooden floor can last for decades and even improve with age! To keep your new floor looking spick and span, remove loose dirt and dust from the floor by sweeping or vacuuming, and wipe over with a damp mop to keep clean. You can also maintain your solid wood floor by applying a treatment such as wood floor wax or oil. 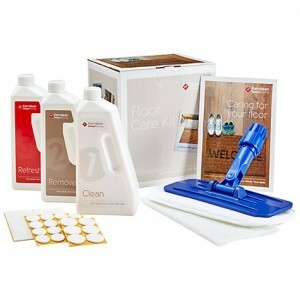 Browse our range of floor treatments or contact us for more info. We hope this has helped you to understand the different methods of how to lay your solid wood floor. However, if you are unsure or have any further enquiries, please do not hesitate to contact us for advice. As solid wood flooring is a natural product, it will need to acclimatise to the temperature and humidity of your home before it is installed. Some species of wood can be left in their packaging to acclimatise, whereas others will need to be removed from the box. The time the flooring needs to acclimatise will also vary depending on the species of wood. Finally, prepare your subfloor by ensuring it is clean and dry. 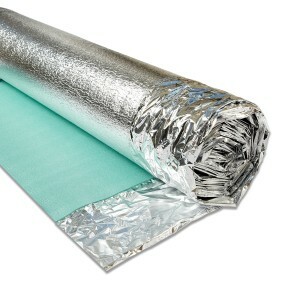 The underlay you need will depend on the subfloor you will be installing it on. For example, if you are installing the floor on top of concrete, you will need an underlay that acts as a moisture barrier. To install your underlay, simply roll it out from one end of the room to the other and cut to size. If your room is an unusual shape you can use separate pieces to cover the space, being sure not to let them overlap. It is also important to leave extra space for any pipes. Once you have allowed your flooring to acclimatise and added your underlay, you can start to install your floor. There are many ways to fit a solid wood floor, the method described above using an underlay is considered the easier method. 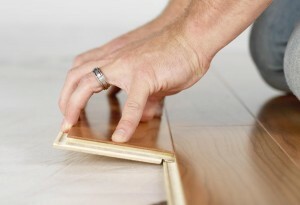 However, you can also fit your floor using a secret nailing or glue-down method. Secret nailing is a method used when laying your flooring straight onto a wooden sub floor or joists. It is named ‘secret nailing’ as the boards are secured by nailing at a 45-degree angel through the tongue of the board – meaning that the nails cannot be seen once the flooring is finished. Glue-down is also a popular method of installation and is usually used when laying wooden flooring over a concrete subfloor. Adhesives have a flexible quality which works well with the natural swell and movement of wooden flooring.